I'm so very excited about this! I've been wanting a rainbow ring sling again for several years -- it's what I think of as my signature sling -- and when Alisa from Tekhni Wovens said she'd work with me on one, I jumped at the chance. 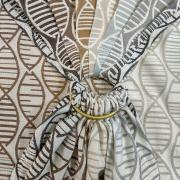 The design is of stylized DNA strands, each a little different from the next, and because of the way the pattern repeats, each sling will have slightly different designs on the rails. 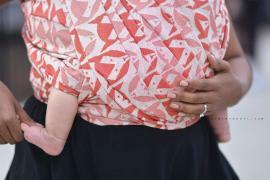 DNA means many things to me: my degree is in biology, and I started babywearing because it enabled me to parent in a way that made the most biological sense. Our DNA is a continuous link not just to our ancestors, but to all of life on Earth. It makes us unique, but it also joins us to each other. It makes us a family regardless of direct genetic relationships. 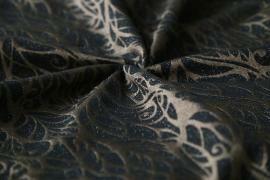 The fabric is a jacquard woven with a 55% cotton and 45% Repreve blend. Repreve is made from 100% recycled water bottles. It's very strong and durable, and adds cushiness to the fabric without making it warm to wear. Recommended from newborn to preschool and beyond. 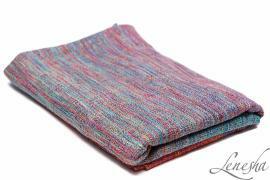 The rainbow, Spectrum, is a joyful gradation from red to violet, with subtle warp changes that pleat beautifully. Terra, a rainbow of neutrals, reflects the colors of Earth, and of humanity. To me, they represent hope, and what is good in the world. Mořské vlny, tanec trávy ve větru... vlny, které přicházejí, když se rodí nový život. Nový vzor Motion je toho všeho oslavou. Přichází ve dvou barevných variantách: Sea Motion - všechny barvy moře, od tyrkysové po temnou petrolejovou - a Love Motion: odstíny růžové od světlé a sladké po tmavou burgundskou. Šátek je robustní, určený zejména větším dětem. This is true gem from our collection of gems. 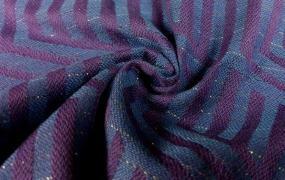 Woven on gray egyptian cotton warp thick, double twisted seacell in combination with space dyed Tsumugi silk. Natural colored, shiny gems has gentle view on this melange colors. Looks stylish and will be perfect both for casual and special events use. Best luxurious blends in one piece of fabric. Medium weight ( but still on the thicker side) , after first wash will be super soft and cushy. Feels very soft on shoulders and the weave structure add good gripp to this wrap. This wrap is very moldable and has really good bounce. Perfect from squish to toddler. Hier kommt das perfekte Sommertuch! Ein Traum, von Anfang an weich wie Watte. Wunderbar weich und du wirst deinen Tragling kaum auf den Schultern spüren. Can´t Stop The Feeling hat einen wunderbaren Grip und fließt durch deine Hände beim Binden. Sitzt perfekt und lässt keine Wünsche offen! Einfach ein tolles Tuch für Neugeborene, Babys und Toddler! 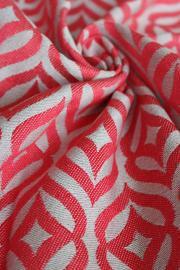 The Alpha line is a brand new design to the Tekhni Wovens family. A modern and graphically bold take on these whimsical and cunning creatures, Alpha is foxes done Tekhni- style. 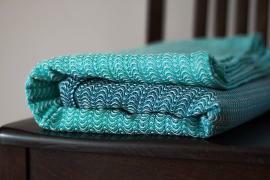 This Cotton and Repreve based woven (55% cotton, 45% Repreve) is a medium-bodied, soft and cushy wrap, suitable for all ages. A great mix of grip and glide thanks to the twill-weave texture. The Heirloom colorway is a high-contrast combination of natural cotton warp and tomato-red Repreve yarn weft. It is gentle and supportive with a bouncy "wool-like" body and wonderful breathability. Repreve blends combine the best of comfort, sustainability and safety all in one wrap. 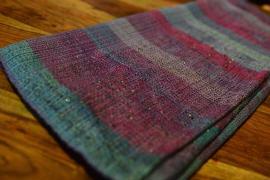 Sagitta Harvest is woven with an ecru warp and a beautiful, golden Eco2cotton fill. Perfect for any season, this golden mustard hued Sagitta with amazing texture, also has unparalleled support. Eco2 yarns are made using the post-industrial cutting scraps from t-shirt and apparel manufacturing facilities. The scraps are collected, separated by color and washed. The sorted and washed scraps go through a shredding process. The shredded fiber is spun, plied back into yarn and then woven into wraps. Setkaný soft triweave v královském složení i barevnosti, vhodný na celé nosící období. hedvábí 12%, mercerizovaná bavlna 10%, seacell 8%. 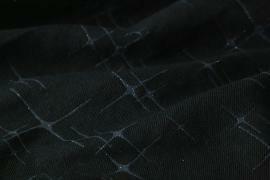 Shiny and shimmery mulberry silk in the color of liquid gold on black with silver sparkles. The wrap is woven in our classic triweave. It is soft from the start and requires nearly no effort to break in. 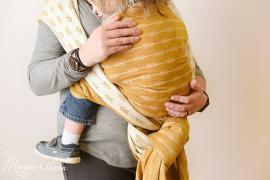 The wrap has a good drape, is gentle on the body and is easy to handle. Suitable for all. Unser Weihnachtsspecial Tragetuch ist endlich da! Hawe Eywa besteht aus 98% Baumwolle und 2% Glitzer. 63% Egyptian cotton, 35% superwash merino, 2% sparkles, 285 gr/m2, raspberry weave size 6 - 380€, size 5 - 350€, size 4 - 320€, scarf 200x34cm - 110€, scarf 175x34cm - 100€ Black with silver sparkles. Classic and eccentric in one. 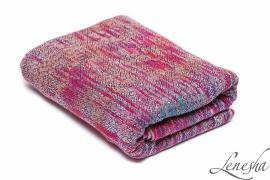 Woven in our signature raspberry weave, the wrap requires nearly no breaking in effort. Soft from the start, gentle on the skin. The sparkles do not scratch. Suitable for all. 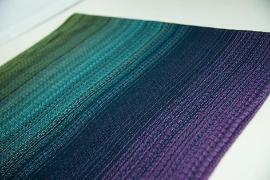 We are offering a preorder for our highly demanded gradient wraps in the Sweetheart weave and brand new Willow weave. These gorgeous weaves will will be complemented by gorgeous jewel tones. 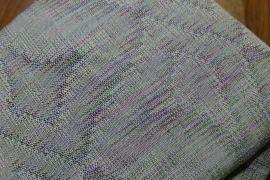 You can choose from FOUR weft colors and transform your wrap from a dark winter to a soft summer. Wrapping not your thing? We are also accepting pre-orders for Kokobus. Finally, our customizable leather bags are available. These fabulous bags allow you to keep a functional piece of this babywearing journey with you forever.